BP1546 - Fireball Forward! 2nd Edition. 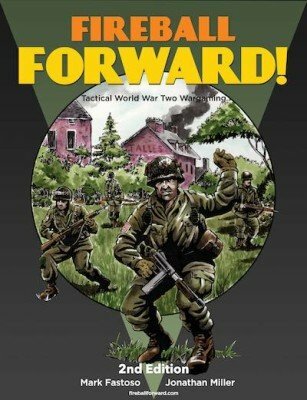 Fireball Forward is an innovative rules set for re-creating company-scale engagements in WWII using tabletop miniatures of any scale. The game is easily learned, fast-playing, and above all it emphasizes story elements of the battle so that the narrative which emerges has a natural feel of a historical written account. Attention is focused on active units, and the full story of each activation is followed until a natural break point is reached, similar to the end of a paragraph in a historical memoir. The game turn has no fire phase, rally phase, etc., but instead, active units may fire, move, rout & rally in any order as needed to develop their plan. Non-active units play an important role at all times, looking for opportunities to derail the active plan. Fireball Forward is playable on a kitchen table in one evening, and it’s designed to challenge players with realistic tactical choices, resulting in a satisfying game for everyone.